Wealthy Affiliate: Premium Membership 2018 Review. I signed up to Wealthy Affiliate almost four years ago for my free membership and I started working on the free 10 lesson course since the first day, I built up my first free website with siterubix and from that day my journey as an online entrepreneur has been a great adventure. I was not the same as I am today as an online entrepreneur, my idea of having a website or a blog was totaly different from how I see my daily work as I keep working every single day to build up a solid online business. Little I knew then about what it is required to know and to do, to reach success with a website, today I’m still learning as things change so fast every day and everyone who wants to work from home need to work every day to understand how it works and what steps to do to keep your business going and make a full income from it. As you might know by now, if you have been on my blog before I’m a Premium member of the best community on the internet where I can learn everything I need, to build my own online business: Wealthy Affiliate. You can sign up today for your free membership and start the free 10 lesson course, yes it is totally free and they won’t ask you for your credit card at all, and you can even build up your very own free website. At the 9th day Wealthy Affiliate will offer you to sign up to Premium membership, but this paid membership: $19 dollars the first month and $49 dollars the subsequent months. This review includes some affiliate links, if you decide to sign up to it, it will cost you the regular price and I’ll get a percent of it. When you learn how to work with affiliate marketing, you can also can start earning with it. Does it worth it? -Yes it does, every penny! Today I will tell you why I think if you’re serious about starting a website to work from home and make a full income, you should sign up for Premium membership at Wealthy Affiliate. 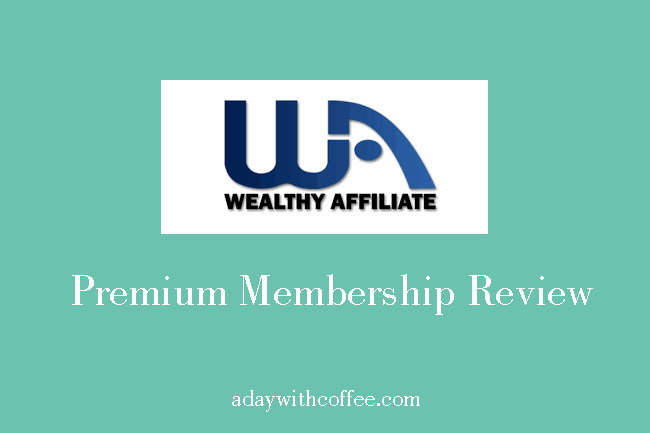 In this review I will be talking about Premium membership only, if you’re new to Wealthy Affiliate I suggest you can read about free membership first. Everything that you can learn and do when you sign up to a free membership is also included in Premium membership. You can be in touch with all the members who are part of the WA community through a private message, including Kyle and Carson. Ask to any member any question you have to help you to learn more and to build up your very own website. When you send a private message to Kyle or Carson, it might take one or two days for them to reply to you as they’re always busy, but they will answer every message they get. # 2 Create unlimited websites. #3 You can create up to 25 websites with your own domain. 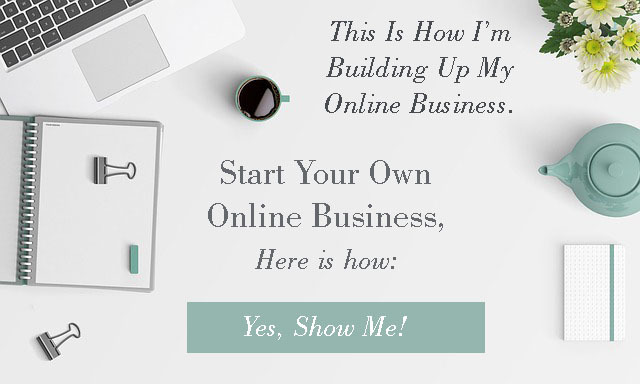 You can create your first own domain website while you learn how to build up your own online business with affiliate marketing. The more you work on it, it will get better, as you get your website rolling it will start making some income for you, then it will be on you to decide to start a second website, or more to create a passive income for you. Don’t forget, when you create a passive income business, it doesn’t mean it will be working 24/7 by itself, you need to keep working on it every single day and learning the new steps that every day improve to keep it going. 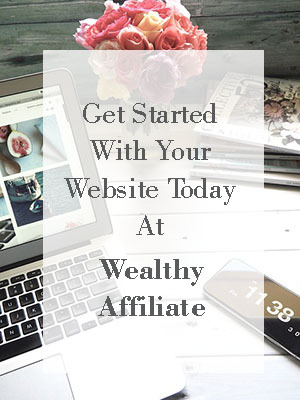 But when you decide to sign up to Wealthy Affiliate, you can focus on your website as Kyle and Carson will always be updating the training for us so we know about the updates on time to keep working on our websites. Every Friday night, 5 pm Vancouver, Canada time; you can watch Jay’s webinar where he shares his knowledge to help you to build up your website. You can watch those webinars from home anytime, as each webinar is recorded and you’ll get free access to them anytime and you can watch them as many times as you want to. #5 Access to all Premium training. Since the first day Wealthy Affiliate opened its doors to the first members, it has all the training ready for members to learn how to build a based home online business by themselves. Today, you can get all the trainings, on 2017 WA updated them, so you’ll get relevant information that will help you to learn and to know everything you need to keep working on your website. Every day many Premium members who already have successful website will create more trainings to share their knowledge with everyone. #6 Be part of an awesome community. When you sign up for your Premium membership, you’ll be part of the awesome community, you’ll be writing your own blogs to share your knowledge but also you can share who are you and why you’re interested to build up your own website and online business. #7 Full access to Wealthy Affiliate. 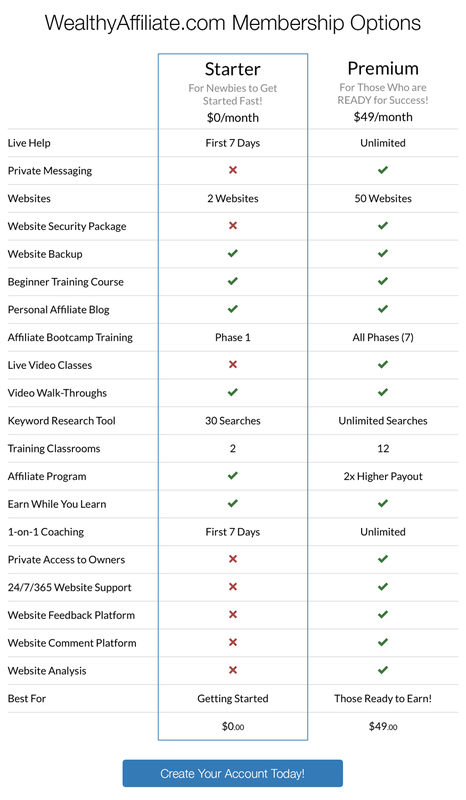 You’ll get full access to all training and everything within Wealthy Affiliate to help you to learn how to build up your own website and online business, you won’t need to pay for more courses to learn it. The only con I can find is, when you sign up for your Premium Membership you’ll get access to everything within Wealthy Affiliate from the first day and it can be a little overwhelming. But if you take one step at the time and you follow the training, you’ll get soon used to how WA works and soon you’ll be used to using all the features WA provides to every member in order to help us to keep working to build up our websites and start working from home. If you’re a beginner and you want to follow a training to help you to follow a step by step to create a website to start your own online business. If you have been blogging but you want to start doing some affiliate marketing to start creating a passive income. If you have been working / creating affiliate marketing but you want to learn more and learn from people who have reached success and are willing to share their knowledge. If you have an offline business, but now you want to get a website for your business and offer more services for your clients. You want to learn more about how to do local marketing. If you have been working on your own website but you’ll love to learn how to monetize it now. Get all the help you’re looking for from online entrepreneurs. While you work to build up your own online website, you can talk to any member on the site (24/7) and ask any question you have, they will help you find the best solution for that particular question. When you’re very new to Wealthy Affiliate and you sign up to Premium Membership, you’ll get a 50% discount of the monthly membership, you’ll pay only $19 for the first month. When you sign up to a Premium membership, I’ll be there to coach you and to help you to build up your website. A big bonus you’ll get also when you sign up to Premium Membership. Every Premium member of Wealthy Affiliate has access to Jaaxy.com to get the best keywords to write the best content for their sites that will help them to get the best performance and get more sales from their websites. I have been part of this great community, and I keep learning the steps that help me to build up my online business so I can work from home. Every day, you can find me there, working, reading, learning, and writing also blogs to share my success moments and motivation to help other members and newbies of this great community to keep working to build their own online business. Are you ready to start learning to create your own website and work from home? you can sign up here! If you have any questions about Wealthy Affiliate Premium membership, write a comment below and I will reply to you.